Don’t compare your beginning to someone-else’s middle. When you start out- it’s so easy to play the game of comparison. Getting caught up in what others are doing is not a good use of time, mind space and mental energy. It is critical to enjoy the journey and not focus so much on a particular destination. Everything happens when it should- and as a founder it shouldn’t be about making a certain amount of money or a contract with a retailer- it should be because you are passionate and excited about sharing your product. 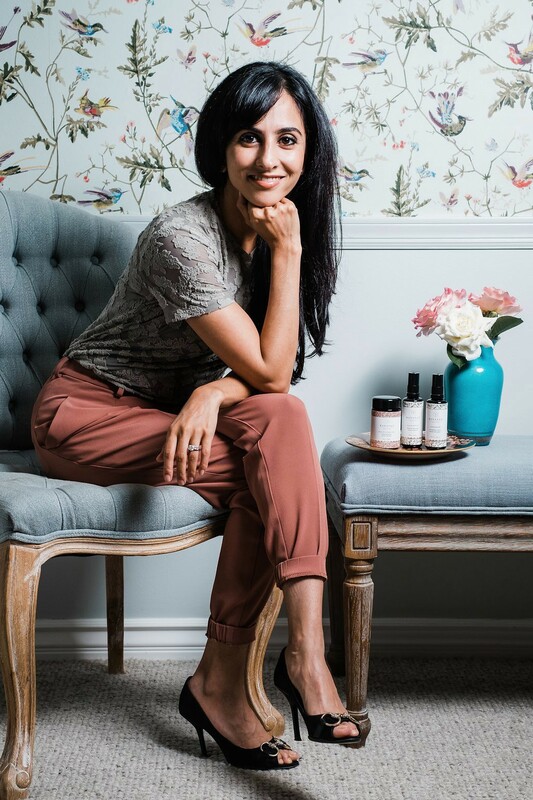 I had the pleasure of interviewing Michelle Ranavat, Founder of Ayurvedic-inspired Ranavat Botanics which focuses on the best ingredient sourcing as the foundation — and it’s part of the founder’s history. Ranavat is an extremely potent Ayurvedic Beauty line launched in 2017. Inspired by the beauty traditions developed for India’s lavish royal families, Founder Michelle Ranavat taps into her Indian heritage to launch Made Safe-certified powder masques and three USDA-certified organic tonics that utilize rare and potent certified organic Ayurvedic herbs inspired by her families recipes along with a new Radiant Rani Saffron-based serum. In 2008 when Lehman Brothers crashed I found myself without a job and falling back on my Engineering degree. I had studied Industrial Engineering in undergrad and have a Masters in Engineering Management- either of which I had used. I went on to work with my dad to grow his pharmaceuticals company- where I oversaw sales and quality. I was able to visit factories in all parts of the world and fell in love with ingredients, quality and the process of creating something. After having two boys and while on maternity leave I found myself relying on our family remedies (anchored in Ayurveda- a medicinal science from India) and experienced how well they worked. I started feeling burnt out as a new mom and took solace in these skin rituals and loved the way I felt and how my skin looked. I founded Ranavat Botanics as a way to share the art of self-care. I was so inspired India’s focus on craftsmanship, creating art for art’s sake and indulging our senses in the most luxurious treatments. The Royals in India experienced all of this- and they knew thousands of years ago that self-care was more than being beautiful on the outside, it was a way to be healthy and feel good on the inside as well. Having a background rooted in manufacturing and science, I knew that I could bring these treatments to life in an elevated, modern light. Also becoming a mom of 2 boys, I was so burnt out- and I took solace in these rituals because they were away to feel good about myself and give back to my mind and body. At Ranavat, we are changing the way people think about self-care. More than having beautiful skin, using our treatments encourages you to slow down, listen to your body and treat yourself to these beautiful active botanical ingredients. We share our treatments individually but also as Rituals- where we include carefully curated combinations of treatments that allow you to bring the beautiful experience of self-care into your home effortlessly weaving it into the fabric of your life. My dad has been an incredible mentor to me. He came from India in the 70’s with little money and started a small business in the basement of our home. Slowly but surely he cold called his way to building a business. I witnessed that hard work, honesty and integrity can build a business and it gave me the courage to start Ranavat. When I first decided I would pursue Ranavat, the two of us took an amazing trip all over India, visiting farms and vetting suppliers. It was a moment I will never forget- and having his blessing and support meant so much to me. Not only my father, but also my entire family has been a huge support system for me. From my husband, sisters, in-laws- it’s a full family affair and their support whether physical or emotional has been instrumental in bringing Ranavat to live and allowing me to build this company. This fall is a very exciting time for Ranavat because we are shaking things up in other parts of the world! For our first international launch we will be at Le Bon Marche in Paris, France as a part of their fall exhibition. This partnership is so important to be because Le Bon Marche is the epitome of luxury, quality discovery, all core to Ranavat. Failures are inevitable and it is how you bounce back that will that determine your success. In this one short year I have had some incredible wins, but there were also many challenges. I tried not to dwell too much on things that were not working, but I did not let my ego get in the way of fixing and iterating on them until the worked. It is really important to be a good listener as a founder — listen to your customer, to your mentors and more than anything yourself. When you start out- it’s so easy to play the game of comparison. Getting caught up in what others are doing is not a good use of time, mind space and mental energy. It is critical to enjoy the journey and not focus so much on a particular destination. Everything happens when it should- and as a founder it shouldn’t be about making a certain amount of money or a contract with a retailer- it should be because you are passionate and excited about sharing your product. It sounds amazing to start a company and have it go viral instantly. That does sound great- but the reality is you want to build something that will last a lifetime or even outlast you as a person! If you have patience and build something with integrity that represents your core beliefs and what you want to share with the world, people will eventually take notice and you will have something much more powerful than an overnight success that may or may not fizzle quickly. One of my favorite podcasts is “How I Built This” by NPR. Every single story has multiple inflection points and difficulties, but eventually they persevere and hearing it straight from the founder is incredibly inspirational. I also love Jay Shetty (@jayshetty)- he’s a former monk that is making wisdom go viral on social. Anytime I’m feeling low or want some motivation- I listen to him. He makes me feel so positive and re-charged! I heard Indra Nooyi, the former CEO of Pepsi speak at a Forbes conference and she was so incredibly inspirational. I would love to spend more time with her because she is incredibly hard working, humble and honest. She does not sugarcoat the sacrifices she made with her family and in her life to become CEO of Pepsi. I admire her perseverance and would love to spend more time with her.